Okay, that's not entirely true. I just finished Lost Boys. For this post, I was planning to write about my fabulous writing group and their awesomeness and how I don't deserve to be among them until I really start earning my keep. 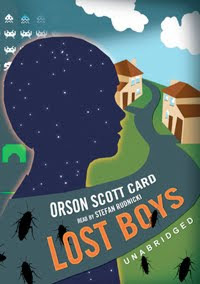 Then, I finished Lost Boys--the awesomeness of the writers' group can wait. I'm sure it will make for a fine post, later. I am a late comer to the OSC camp. It was probably 20 years after Ender's Game was published that I first read it (even then it was only after a prompting from my wife--funny how they just know, isn't it?) Well, Ender's Game is a gateway drug and I was quick to understand the brillance that is OSC. I was even fortunate enough to attend Uncle Orson's Literary Bootcamp and spend a week with him. Everytime I think I've got a handle on it, he hits me upside the head with more brillance. But how did he ruin my workout? I spend an hour to an hour and half driving every work day. I spend most of that time listening to books (a bit less during football season, then I do indulge in some sports radio, but still.) Recently, I've been listening to Lost Boys. Before heading home, I went to the gym and hit the treadmill, while listening to Lost Boys. I was only about a third of the way into my workout when I figured it out. I had to step off the treadmill. The last chapters have such emotional resonance that I had to stop. It became clear rather quickly that the workout could not continue. If I were driving I would've pulled over. I'll have to switch to something else during my workouts, otherwise I'll be fat, then again, at least I'd be fat and happy. I know a lot of people don't like this particular novel. Some kind of like it, while others didn't like it but eventually came around. I love just about any novel that moves me--that has a lasting impact on me. That makes me feel like I know these characters. I read The Da Vinci Code and I was entertained, but I can't hardly remember any specifics about it. 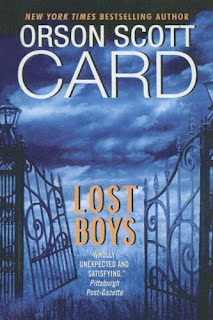 I don't think the Lost Boys will fade from me for a very long time, if ever. Some of the subject matter will not appeal to everyone, but it's a credit to Card to make a compelling story out of Mormons going to church, although there's certainly more to the book than that. As well, I've yet to read an author who can do deep penetration like he can. What he achieved with this book is what I try to do in my own writing, make an emotional impact, show sacrifice and love. He did it beautifully. It is said that every author leaves a bit of himself in everything he writes. In this story Card leaves more than a bit. I remember him saying at Bootcamp that this is essentially an autobiography. At the end of the audio book he gave a brief interview and talked about how difficult it was to write because it is such an intimate telling of his life and how he will never do such a thing again. "I did it too well," he says. "I will never do it again because the cost is too great." I'm grateful that he dared write it. Aside from the amazing writing itself, I found much that I could relate to. This will probably sound corny, although it sounded pretty good in my head, but I'm reminded of that line from the movie, As Good As It Gets. Melvin and Carol are at dinner and in order to compliment her, he explains that he took his medication that day. Carol doesn't quite understand so he puts it another way, "You make me want to be a better man." OSC, you make me want to be a better writer. We'll talk. Card did publish it first as a short story. You can find in volume 1 of Maps in a Mirror. That one is in first person, where as the novel is not, so that gives it some distance which makes the subject matter easier. It is probably one you won't want to read twice, but I would recommend reading it once. Like I said, we'll talk. Freaked me out so bad reading it at night I finished the rest of it at the pool in the light of day. These stories are gritty and great, reaching deep with unblinking insight into the unforgettable characters. Readers will feel inspired to dig for their own hidden strength. I envision Anne Hatheway as the protagonist, Zoey Ashe. An Excerpt from Joanna Barsh's "Grow Wherever You Work."